Some of the most iconic dishes enjoyed and loved in America don’t come from America at all, they stem from all over Asia! If you are looking for interesting dishes, loads of flavor, and expanding your Asian recipe collection, this class is for you. Learn how to create some of your favorite “only at a restaurant” cuisine in the comfort of your own home. This class will cover dishes from Japanese to Indian and everything in between! 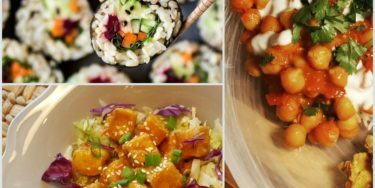 Five flavorful and delicious recipes to taste and take home including: Indian Tikka Chickpea Curry, Buddha Sushi Rolls, and Chinese Orange Crispy Tofu and Broccoli! So grab a friend, family member, or spouse and come join this fun night out enjoying some the best dishes in the world! This is a hands on class and participants will be helping create one of the dishes to share with the class. Sign up soon, only 16 spots available per class. Tickets are non-refundable but are transferable to another person.